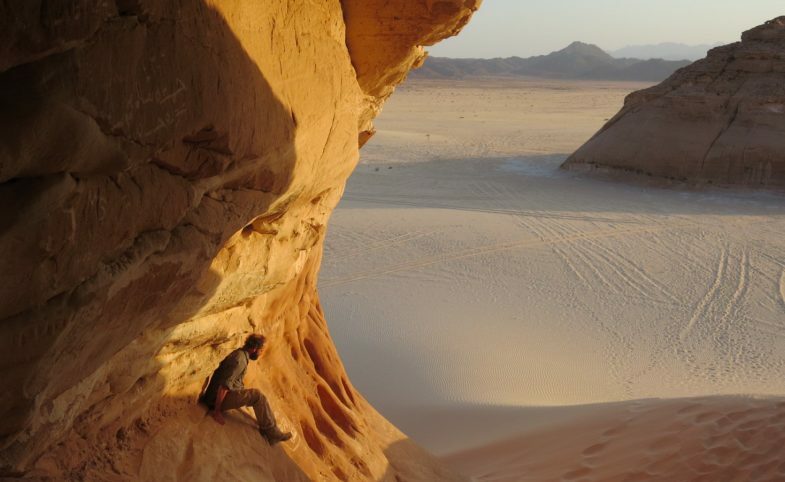 Set your sights on the horizon to make this epic traverse of Sudan’s Bayuda desert. 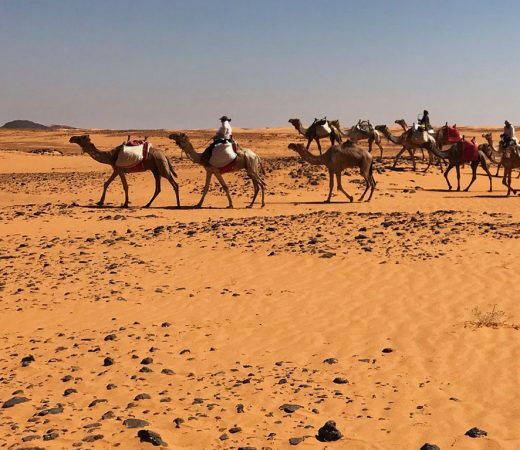 Travelling by foot and camel as the desert nomads have for centuries, you’ll follow in the footsteps of the ancient Meroitic civilisations and the desperate military march of the 1885 Gordon Relief Expedition. With hot days and cool nights under a brilliant canopy of stars, you’ll need to dig deep and embrace the silent serenity of the desert on your crossing of the ancient Kingdom of Kush. 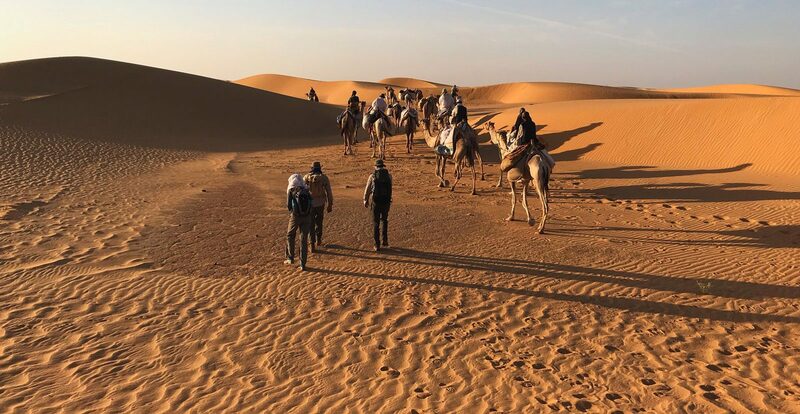 The aim of this Redefined Classic expedition is to cross the Bayuda Desert – a journey of around 280km – on foot and by camel. 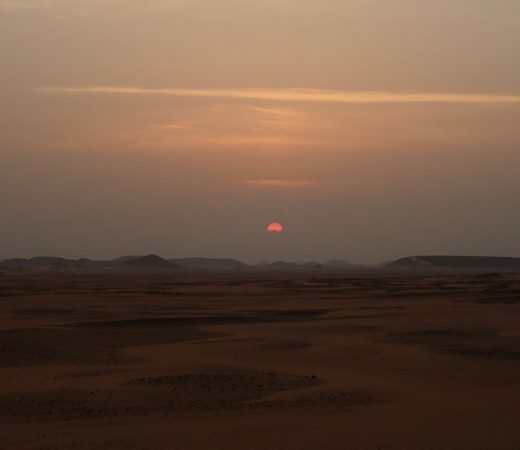 A stark and unforgiving landscape, crossing this corner of the Sahara will require the team to carry everything by camel and pitch camp each night in a remote desert under an unspoilt starlit sky. Each member of the team will be allocated their own camel for the duration of the expedition, with the freedom to alternate between riding and travelling on-foot. Along the banks of the Nile clasping the southern edge of the Bayuda desert, the team will explore the Meroë pyramids which – along with the Nuri pyramids on the northern edge of the desert – were the termini of the Bayuda Desert Route, a hugely important lifeline connecting the northern and southern districts of the Kingdom of Kush in 600 BC. Journey through diverse Saharan desert scenery. Follow in the footsteps of ancient Meroitic civilisations. Find companionship in your own camel. Explore the pyramids and tombs of the ancient Meroitic civilisation. Camp under the stars of the desert night sky. Interact with the Bedouin, and local herders as you visit desert wells. 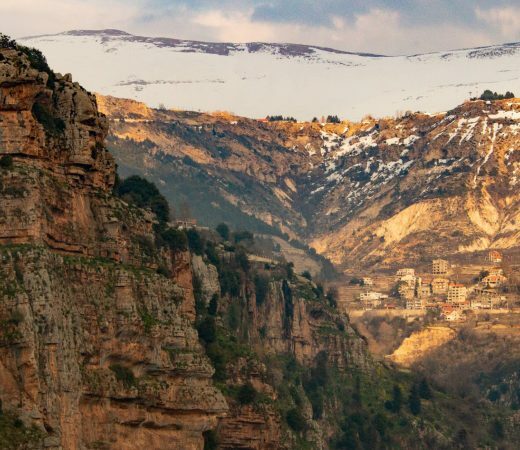 Experience the hospitality of a country rarely visited by western tourists. “Just returned from Sudan, my first experience with Secret Compass – It was absolutely fantastic. The professionalism of the company is immediately obvious with the pre-trip information and advice. Our trip leader, Luca, was wonderful and worked tirelessly to ensure the health and security of our group. I’m very much looking forward to further travels with Secret Compass and I would highly recommend them.“– Christopher Brown, 2019 teammate. 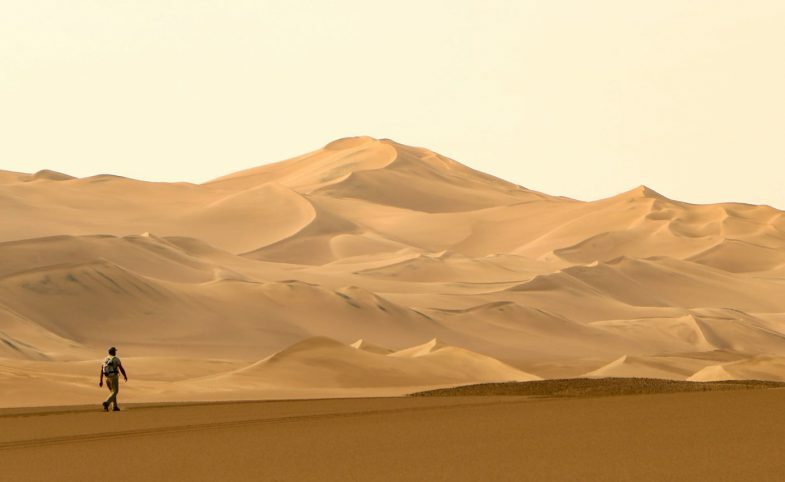 Part of the larger and better known Sahara, the Bayuda Desert covers an area of 100,000 km² in NE Sudan. Sitting within a huge bend in the river Nile it is encircled on three sides by the river: a vast stretch of rocky plains peppered by solitary acacia trees and sparse dunes. With the temperature easing and the stars taking centre stage, at night, the desert embodies a totally different tone. Far from the man-made light pollution our lives are so familiar with, the Bayuda desert sits beneath a canopy owned by the Milky Way, sweeping across the sky in a grand, breath-taking spectacle above the sand. There’s nothing like a vivd night sky to add a little perspective. While Sudan’s reputation for civil war precedes its hundreds of pyramids, there are in fact more pyramids in Sudan than in Egypt. This expedition ends at the ancient city of Meröe, a collection over 300 pyramids predicted to be over 4,600 years old. Built in the reign of Nubian kings, they are significantly smaller and steep-sided to their Egyptian counterparts. 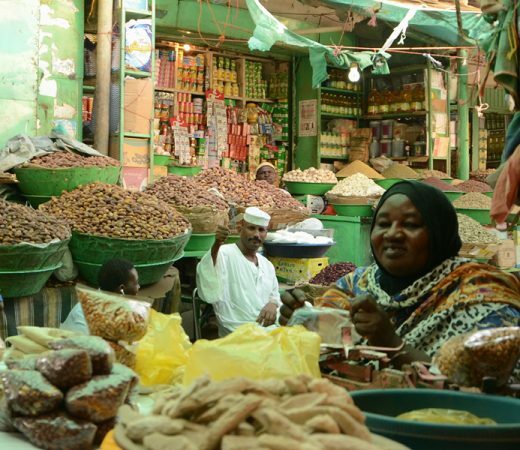 Contrary to popular perception, the Sudanese are among the most hospitable and friendliest people in Africa and are incredibly welcoming to tourists. The meeting point between Africa and the Arab world, it is home to diverse tribes, languages and cultures. Along this desert traverse, the team is likely to encounter herders at wadis and wells, collecting water and tending their flocks. In their crossing attempts, our teams have experienced temperatures soaring to well above 45°C+, even in the supposedly cooler months of January-February. You’ll be wise to follow your local Sudanese companions by example, and make good use of your four-legged comrade on the long, hot days likely in the Bayuda. 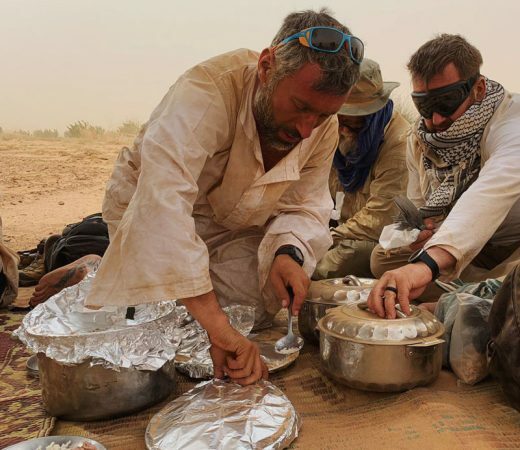 While the caravan of camels will be large enough to carry you and your personal belongings, vehicles will provide emergency support in the event wells are dried up to supply the team with sufficient volumes of water for the duration of the expedition. The great bend of the River Nile which confines the borders the Bayuda Desert sweeps in a 600km long meander to the east. 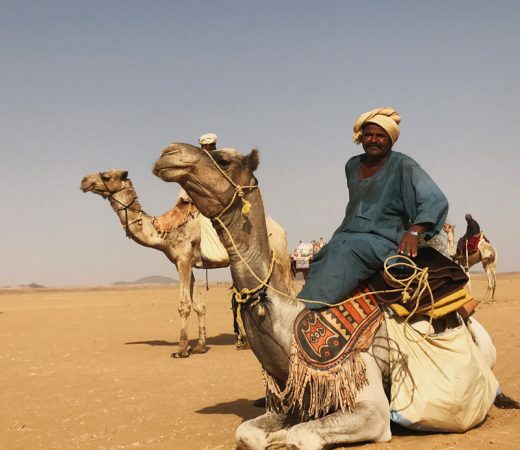 For those with sufficient knowledge to venture into its wilderness, the 280km Bayuda Desert route has been an important shortcut, linking the Nile communities either side of the desert for thousands of years. In 600BC, the route through the desert was a lifeline linking the northern and southern districts of the Kingdom of Kush, and the evocative ruins of the Meroë and Nuri pyramids and temples still stand at its southern and northern termini. More recently, in 1884–1885, the Bayuda Desert route was used as a shortcut by the Gordon Relief Expedition – a desperate military march across Egypt and Sudan to relieve General Gordon and the siege of Khartoum. After a journey of over four months, they arrived just two days too late. On our journey we’ll visit the Jakdul pool, the only open water pool in the Bayuda desert and used by the British team as a base during the relief mission. Follow in the footsteps of adventurer Levison Wood. As part of his epic Walking The Nile expedition, Levison walked over 4,000 miles from the source of the Nile in Rwanda to the Nile delta in Egypt where it flows into the Mediterranean Sea, part of which saw him crossing the Bayuda Desert. Making the crossing in January rather than July, team can expect much cooler temperatures than those experienced by Levison, and to join the privileged few people who have taken on this challenge. Secret Compass runs expeditions with framework itineraries, rather than guided tours with set daily plans. Read more about Our Approach here. The following is the outline plan for this Sudan expedition – the ‘substance’ rather than the specifics. A fuller itinerary is provided in the Sudan Expedition Handbook which is available on request or upon application to join the team. All teammates should arrive at the team hotel in Khartoum ready for a team briefing with your Secret Compass Team Leader at 1800 on 19 January. After the team briefing and welcome team dinner head to bed for an early night, the real adventure starts the following day. After breakfast the next day travel from Khartoum to Metemma by road via the Nile’s sixth cataract at Sabaluka and the town of Shendi on the banks of the Nile. From here cross the Nile by bridge to Metemma on the opposite bank where the team meet their camels and their handlers for a briefing on the art of camel-riding. Then, it’s into the desert to make first camp. Equipped with almost no modern technology, for the next nine nights we carry our entire world on camelback and make camp each night in temporary camps. Moving at the steady pace of 4-5 km (2-3 miles) an hour, we cover an average of 30km (18 miles) per day. At this pace, we’ll experience the desert in a way nomads have for centuries – on foot and on camels. Epic desert traverse complete, the team bid farewell to the camels and their handlers. After visiting the pyramids and temples at Nuri and El Kurru, we drive south to Bejrawiyya – site of the pyramids of Old Meroë. 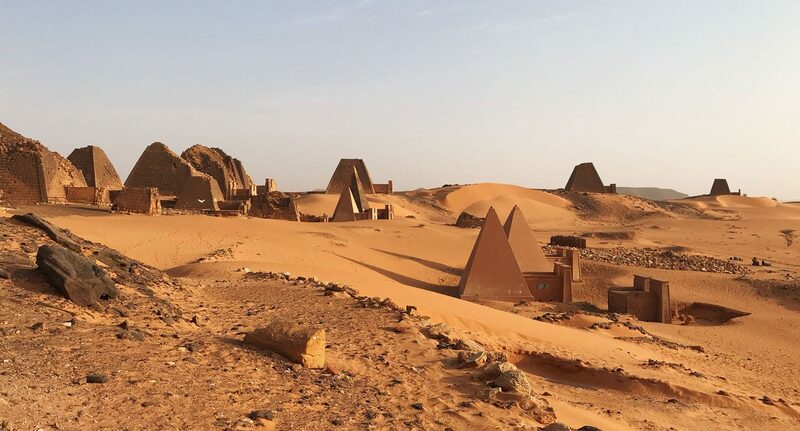 Smaller than Egyptian pyramids but with steeper sides, these pyramids are the tombs of the ancient Meroitic kings and queens who reigned in Nubia from 300BC to 300AD. We’ll have the opportunity to enter some of the tombs where you’ll find hieroglyphic inscriptions and murals to rival those in Luxor. After travelling back to Khartoum, the expedition officially ends after breakfast on the 2 February, but team mates can depart any time as some flights leave early on Sunday morning. Secret Compass expeditions are achievable by anyone with a healthy lifestyle and a good level of general fitness. 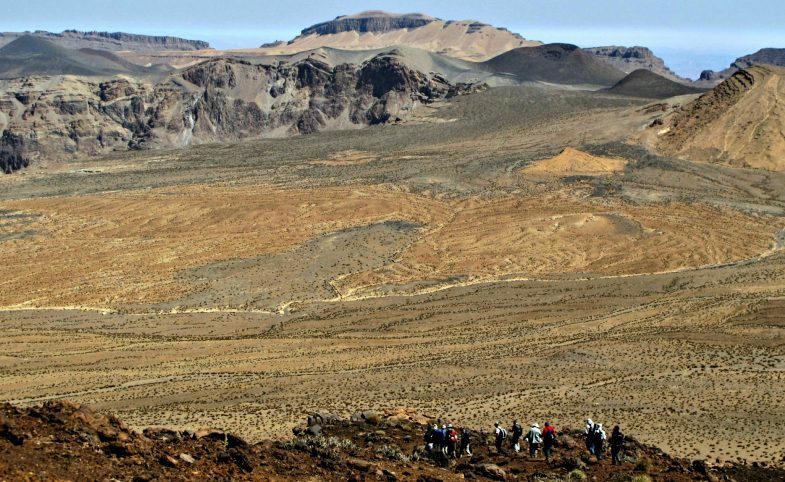 The trek requires no special technical skills, but you are required to be capable of travelling in a remote region for the duration of the trek without external support. 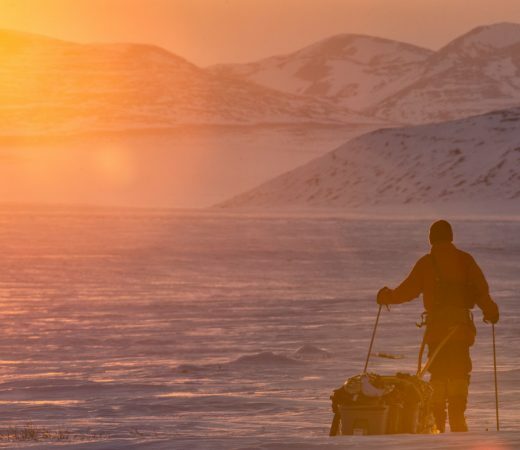 The most challenging aspect of this expedition will be the heat – with daytime temperatures of 30 – 45°C+. Team members should be willing to be part of a team working together to achieve the goal of the expedition, and should have a flexible and robust spirit towards the challenges you may face as part of an expeditionary adventure. Trek or camel ride: up to 30km a day. You can ride or walk as much or little as you want but be aware: camel-riding is not a passive activity and requires fitness and agility. Carry: up to a maximum of approx. 5 kg (you will not have to carry your own kit or provisions, but a day pack with your water and immediate requirements is convenient). Terrain: a variety of desert terrain including rocky, uneven, sandy and sometimes steep terrain. Climate: very hot and dry (30 – 45°C+ during the day), potential sandstorms, cooler nights. Professional Secret Compass expedition leader with full medical and communications kits. In-country Sudanese guides, support and vehicles. All accommodation throughout as described. All food (snacks and meals) and soft drinks from dinner on day 1 to breakfast on day 15.
International flights to and from Khartoum. On application to join this epic expedition to Sudan, potential teammates will receive a detailed Expedition Handbook. Here are some expedition-specific questions and our general FAQ will answer many other questions. Get in touch if your question remains unanswered. Will there be phone signal or Internet? There should be signal in Khartoum, however it is very unlikely that you will have signal in the desert. You Secret Compass expedition leader will have a satellite phone and radios for emergency communications only. Do I need to cover-up? Women: Non-Muslim women are not expected to wear a veil or cover their heads, but should dress modestly and respect local customs and sensitivities. All: Shorts are not appropriate for either male or female team members. Due to group transfers from the start and end of the trek, the start and end dates for this expedition are fixed. Once in Sudan we will arrange all necessary permits for team members. This includes travel and photography permits. However, as in many countries, taking photos of government or military buildings or facilities is not advised and consideration should be taken when photographing people. There will be no access to power once the trekking section begins. Please ensure that you are self-sufficient in terms of charging your appliances by bringing things like spare batteries, lightweight solar panels or power packs to avoid frustration. No. The sale and consumption of alcohol is illegal throughout Sudan and this prohibition applies to tourists as well. I’m Israeli / I have an Israeli stamp in my passport – will I be able to visit Sudan? Unfortunately, Israeli citizens will not be issued an Sudanese visa. Additionally, if your passport has an Israeli visa or Israeli entry/exit stamps you will not be allowed to enter Sudan. Generally, cameras should not be that affected by the heat and dryness, but if it reaches over 45 degrees they might struggle. It is advised to keep your camera in its bag until you use it and don’t keep in the direct sunlight for too long. The main problem is the sand itself: Grains can easily get into the lens systems, particularly compact cameras with zoom lenses. Ones with electronic lens covers are most at risk. The best cameras to use are sealed waterproof cameras which have no external working lenses so no sand can egress them. If using an SLR, then take care to prevent sand getting into a lens housing. Using Prime fixed focal length lenses can help. Take a small paintbrush, a puffer bottle or, even better, a compressed air canister (probably bought in-country if flying in) to blow away sand and grit from moving parts. Take care around the sensor and never wipe this if sand is on the sensor. Take particular care if the wind is blowing or the sand is very fine. There will be no toilets or showers available during the trek. You should be prepared to duck behind the nearest sand dune ‘al-fresco’ and limit yourself to wet-wipe washes. Toilet paper is generally burned or packed out in sealed plastic bags. As we are carrying our own water into the desert here will not be enough to provide showers of any nature. Wet wipes are the way forward: and remember, you’ll all be in the same position. Is it safe to visit Sudan? Sudan has been embroiled in a civil war in Darfur for several years and the UK Foreign Office advises against travel to certain parts of the country. However, we do not visit any of these areas. In fact, the Sudan is a place where violent crimes are rare and contrary to popular perception, the Sudanese are among the most hospitable and friendliest people in Africa. Whilst Sudan is one of the world’s poorest countries, they welcome visitors and our trips generate much-needed income to the region. Secret Compass run a a 24/7 operations room and you expedition leader will be carrying a full medical kit, and will have access to 4WD evacuation facilities in an emergency. All meals are included on this trip. Please advise us on booking if you have any special dietary requirements.